Neil Armstrong was an American astronaut who walked first on the moon. He also served as Navy Pilot on United States army and also as professor at the Department of Aerospace Engineering in University of Cincinnati. 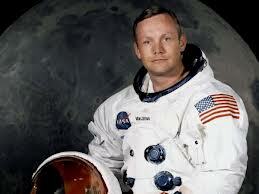 Neil Armstrong born on 5th August 1930 in Wapakoneta city located at Ohio state of United States. His full name is Neil Alden Armstrong. His father Stephen Koenig Armstrong, a auditor. And his mother name is Viola Louise Engel. He got two sibilings as well. Armstrong did his schooling at Blume High School, located at Wapakoneta city, United States. Then in 1947, he joined aerospace engineering at Purdue University, located in West Lafayette, United States. In 1955 he got B.S.Degree in Aeronautical Engineering and in 1970 he got M.S. Degree from the University of Southern California. While doing his bachelor's degree in aeronautical engineering, Amstrong fell in love with Janet Elizabeth Shearon, who was majoring in home economics. They were married on 1956. The couple got three children. Armstrong was approached by political groups but he declined all offers. Armstrong chooses teaching as his profession after Apollo mission. Armstrong was not interested in making money with his fame. He refused many proposals which can get him very big money. In 2005, a barber cuts Armstrong's hair and sold it for 3000 US Dollars. He sent a legal threat to that barber to donate the money to charity. Armstrong was too interested in flying. He took flying lessons at the county airport. He earned his flight certificate, when he was just 15. At that time he did not even had a driver's license. In 1949, he reported at "Naval Air Station Pensacola" for flight training. He took 18 months training over there. He get into action during Korean War happened on 1951. He received the Korean Service Medal after this war. After the war he left Navy. In 1958 he got selected for "Man In Space Soonest" program by United States Air Force. In 1962, he was anounced as one of the pilot, who would fly the space flight. Later Donald Kent Slayton, a NASA administrator called Armstrong to join "NASA Astronaut Corps". Later he become one of the two civilian pilots selected for the second group. The other person "Elliot See", who got selected with Armstrong died in a NASA trainer jet crash. He served as backup commander for Apollo 8 and later he become commander of Apollo 11 mission. On March 1969, it was decided Armstrong would be the first person on the Moon. On July 21, 1969 he landed on Moon. After 20 Mins Aldrin joined Armstrong. They planted flag of United States of America on Moon. Armstrong died at his 82nd age ( 25th of August, 2012 ) in Cincinnati, Ohio. He was one of the person who really hates the act of United States behaving like "Worlds Police Man".